List Armor is web-based software that helps Advertisers, Marketers and Affiliates manage their suppression lists for effortless CAN-SPAM compliance. Use our enterprise-class suppression list management platform at a friendlier price point. Plans start at $95/mo and all of our plans offer a free 14-day trial so you can be sure that List Armor will fit your needs. We are a data security company, so keeping sensitive information safe is our focus. 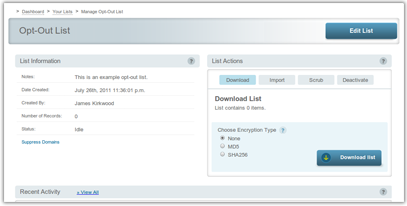 The List Armor system uses industry-standard TLS encryption, as well as providing MD5- and SHA256-encrypted suppression list downloads. Never wait for scrubs, data imports, or downloads. Our innovative technology can get the information you need usually in under a few seconds, making List Armor a transparent solution for suppression list management. Give your affiliates granular access to suppression lists. Allow plain-text downloads, set expiration dates, and track unsubscribes per-affiliate. Allow affiliates to upload their mailing list and download a cleaned list without ever seeing your suppression list data. List Armor offers a full-featured API, as well as automated tasks to allow for seamless enterprise integration and tie-ins with 3rd party systems. Customized landing pages give your recipients the ability to update their preferences if they don't want to opt out completely.